You know what they say: “When life gets you in a tizzy, chill out in Brizzie”. OK, we made that up, but people should definitely say it more often, because the cool Queensland capital is tops. Australia’s third-largest city is in first place when it comes to great weather, outdoor activities and that unexplainable “cool” factor. Is it all the amazing free things there are to do? Maybe it’s Fortitude Valley, Australia’s first district that was designated especially for partying. But we think it comes from the sheer diversity of awesomeness. In fact, we think you should just skip looking at hotels in Brisbane and move here already! Just kidding. But you should book with Wotif today and get ready for a holiday that’s chockablock with adventures. This isn’t called the “Sunshine State” for nothing. Brisbane’s got 283 days of sunshine a year and plenty of ways to enjoy it. 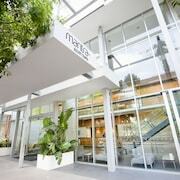 Get out of Brisbane hotels and take to the river, park, island or trail. We told you the things to do were endless. Jump aboard a CityHopper, the free ferry service that leisurely floats up and down the river. Free cruise? Yes, please. Brisbane holidays are full of free stuff: The city’s self-guided art trails are sure to make you feel cultured. On the Cultural Heritage Public Art Trail, you’ll see everything from 19th century memorials to contemporary sculpture, all while soaking up that QLD sunshine. For an unforgettable day trip, hop the ferry to Moreton Island and go snorkelling, sand tobogganing and swimming. The Champagne Pools on the island’s north side are a worthy Instagram snap for any feed. Brisbane is more than just a pretty face, though. Brisbanites are darn smart, too. Yes, this city is the total package, as evidenced by its residents’ brilliant inventions over the years. Whoever thought to take sponge cake, coat it in chocolate and roll it in coconut is a bloody genius in our opinion. The mystery around who, exactly, tried it first may never be solved, but we know it started here and that it’s delicious, so that’s good enough. Brisbane is home to Lone Pine Koala Sanctuary. Why no one opened one before 1927 is beyond us, but we’re glad someone finally thought of it. And let’s just put it out there: Yes, you can hold the koalas (yay)! Brisbanite Craig Steven Wright may or may not be the founder of Bitcoin, a digital currency that isn’t really real—or is it? The only thing everyone can agree on is that the whole thing is really, really strange. Everyone can also agree that a getaway to Brisbane will be one of the best things you ever did. Well, besides that time you convinced zoo-goers they were watching gorillas play golf. No wait, that was Hamish and Andy. Wake up to the sunrise streaming in through your windows…or don’t! There will be none of that when you’re relaxing in luxurious surrounds at Rydges South Bank. Your blackout curtains mean you can stay in bed all morning using the free Wi-Fi—unless, of course, you want to throw them open for a glimpse of that panoramic city view. Take it all in and think about what’s next. Go for a spin on the Wheel of Brisbane for a bird’s-eye view of Australia’s best city. Any local will confirm that for you. Hit the beach at South Bank Parklands—yes, really! Streets Beach is a manmade wonder with a European feel. You’ll probably be lucky enough to stumble upon yoga, live music or some sort of festival, since there’s pretty much always something on. Walk to the Queensland Museum & Sciencentre for, well, a little bit of everything. One of the world’s oldest diving helmets? Check. Thousands of tiny model trains? Indeed. A day filled with things you never even knew you wanted to know about? Done. 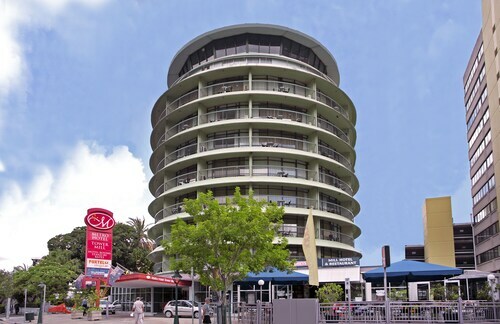 With accommodation in Brisbane’s Spring Hill district, you’re walking distance to many attractions while being just away from the fray. In short, it’s a peaceful stay that can’t be beat. At Punthill Brisbane, wake up to fresh air out on your private balcony, fix yourself a breakfast in your kitchen, then see what inspires you. You’ll find quite the spectacle at Roma Street Parkland—of plants, that is. The Spectacle Garden has an ever-changing landscape of flowers, herbs and dragons. Well, water dragons, but they’re still pretty cool. Take a leisurely stroll to Queens Plaza for upscale shopping. Fuel up to shop till you drop on Burnett Lane, the city’s oldest street. Today it’s home to the hippest restaurants and cafes around. Hit the Museum of Brisbane for some education on how this little colony grew up to become “Bris-vegas”. Rotating exhibits cover everything from famous Queenslanders to the history of Moreton Bay and its famous “bugs”; don’t worry, they’re just lobsters. 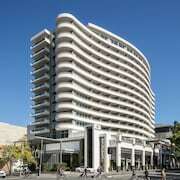 If you want to get in on a party, don your dancing shoes and book Brisbane accommodation in Fortitude Valley. Where does this valley get its strength? We’re pretty sure classy rooftop bars and underground discotheques have something to do with it. 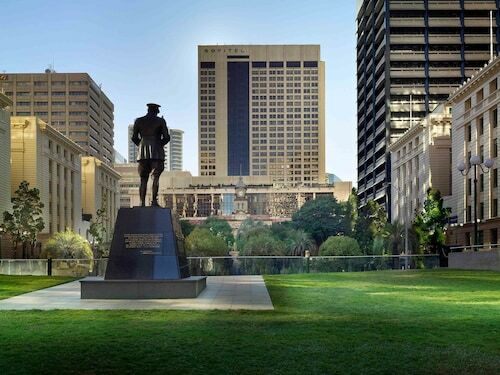 From Brisbane Marriott Hotel, you can walk (sorry, stumble) to it all. Brizzie’s got gorgeous weather year-round, and you should definitely enjoy it—on a rooftop bar! Longtime favourite Alfred & Constance has a house-party feel, and more importantly, a tiki bar. It’s a zoo out there! And also inside The Zoo, one of the city’s most famous (or infamous) live music venues. From reggae to hip-hop to jazz and folk, just check the calendar and choose your tunes. Got robot ears? Dance the night away to electronic jams on one of three floors at The Met. Yes, three! You’re bound to find something great. 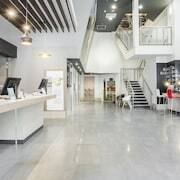 All right, so Gold Coast accommodation isn’t in Brisbane, but it is just an hour’s drive south, and if you want to really live like a local, you totally have to go there. Trust us. 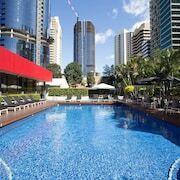 Go beach-hopping from the family-friendly vibes of Main Beach to laid-back Surfers Paradise to trendy Broadbeach. Choose your best match, toss out the towel and relax. That’s the name of the game here. Also beach volleyball—there’s plenty of that. Fall asleep on the sand? Use some of that energy at the area’s famous theme parks. In fact, you don’t even have to go all the way to the Gold Coast CBD. The gigantic and spectacular Dreamworld Park is just 55km south of Brisbane. 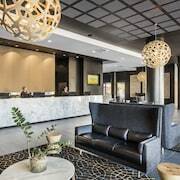 Wotif’s awesome Brisbane hotel deals will leave you plenty of cash to spend on lamington, craft cocktails and day trips. The only thing that money can’t buy is that Brisbane-style cool factor. You’ll have to work on that yourself. How Much is a Hotel Room in Brisbane? 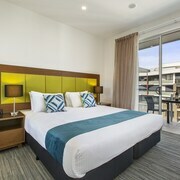 Hotels in Brisbane start at AU$73 per night. Prices and availability subject to change. Additional terms may apply.